As 2018 gets underway, there are a number of top trends that are making a comeback. 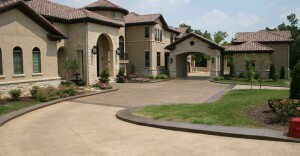 Driveways are the first part of the home that visitors see so when it’s time to update the property, make sure that you have considered the following ideas and themes. Inner city living does not always allow for the sprawling front driveway, but you may still want to have a chic space to park your car and welcome visitors. The short rectangular area leading to the front of the town property can still offer an attractive and welcoming look. Concrete pavers set in parallel lines leading up to the front door or driveway, leaves the middle area filled with coloured pebbles/stones. This helps to complement the outside of the property and keep the exterior on-trend. Combining soft and hard landscape areas and breaking up the expanse of a sloping driveway has seen some stunning designs for 2018. To bring your current driveway up to date, combine a stepped pathway in the same design and material to one side of the drive. Invest in a new stamped or coloured concrete driveway and incorporate a series of planters built in between drive and walkway. These features will soften the approach to the drive, as well as add to the garden area in a way that is accessible. 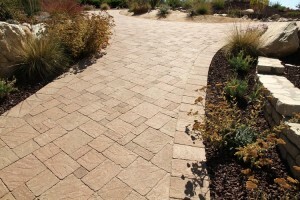 There are a number of hardy native ferns and flowing grasses that will breathe life into the driveway and are able to handle the toughest of climates, so maintenance is not a problem. 2018 is the year where polished and coloured aggregates are really going to come into their own. Either on their own as squares of colour or embedded into the surface of the concrete, they will give sparkle and colour to their surroundings. For modern geometric buildings, stark black and white designs for a trendy monochromatic theme gives the property that “up to the moment” feel. Older buildings may be better suited to the brown and blue tones that were popular in the seventies, however, with a 2018 remodel, they would maintain their stylish look. Outdoor lighting is not only good in terms of safety and security but, if strategically placed, can also dramatically light the driveway in the evening and showcase the home. However, there is no point in shining a spotlight on your driveway unless it is in tip top condition, so discuss a renovation with your local driveway expert before you consider new lighting. With the fashion and interior design world looking back to some of the themes and colours of the 1970’s, garden designers in 2018 are predicting that asymmetry is going to be one of the top trends. Instead of the regularity of paving design such as herringbone for example, they are looking for a more irregular pattern when it comes to patios and pavements. 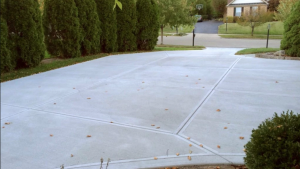 Fortunately, with stamped and patterned concrete, you can have a smooth and safe driveway to park and walk on but still have irregular shapes and designs impressed into the surface. Whichever driveway you choose for 2018, talk to your local professional driveway expert first for some useful advice and tips.